Thanks Vickingxc for the idea of an Easter picture competition. As usual anything goes, it could be a photo, a sketch, kids picture or anything else that takes your fancy. And the prize - well there isn't one, unless we find something suitable. We will however put your picture on the front page! The Commisionsing Editor of Easy Living magazine, Hannah Shuckburgh, is looking for a Deerhound and owner (women only for this I'm afraid) with a strong resemblance to each other. 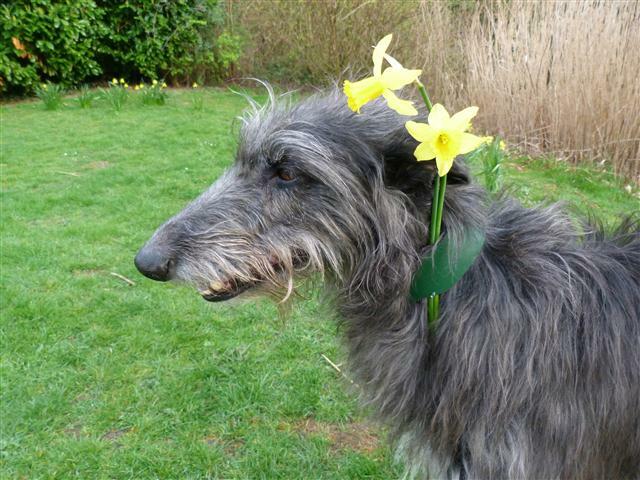 They'd like to see any glamorous Scottish Deerhounds owners who might like to be part of their article. Easy Living will arrange to shoot you and your hound in a studio in London (paying all expenses), provide a stylist, hair and makeup artist – and will provide you with a beautiful print to keep forever. They would also like to do a short interview with you about your special connection with your dog. Please see the forum for more details by clicking here. Good luck everyone for Crufts. Hope you all have a great time. Deerhounds are in Hall 5 Ring 26. They have an early start at 8.30 a.m.
Sunday 13 Toy & Utility. Please let us know if we’ve missed your stand or activity and you’d like it added. Discover Dogs Located in Hall 3. Or if you can’t be there..
look at More4 TV. Crufts transmission times will be 19.00 - 21.00 each night between 10 -13 March. Or on Crufts TV online. There are also videos uploaded regularly on the youTube Crufts channel. Or you can sign up to the Crufts podcast. Finally, if you want to look back at Crufts past, all Crufts schedules and catalogues from 1886 onwards are now available to view online at the Kennel Club and get up to date on the Crufts forum thread. Eleanor Urquhart Luxury Dog Beds won't be at Crufts, but if you are looking for a new luxury bed for your deerhound then mentioning the Scottish Deerhound Forum when ordering will qualify for a 10% donation to the Irish Wolfhound Rescue and if purchasing an Orkney waterproof bed you will receive a Free Blackwatch Sherpa fleece to fit. February/March only. Congratulations Ch Foxcliffe Hickory Wind, first Deerhound to take Best in Show at Westminster Kennel Club 2011. Judged by Paolo Dondina. Owned by Sally Sweatt, breed by Cecilia and Robert Dove and handled by Angela Lloyd, well done to you all. 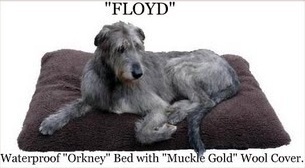 No end of coverage in the media, see the New York Times and the Westminster Deerhound thread in the forum. Dogs Queensland are accepting donations and running a virtual dog show to help their members affected by the recent flooding. Thank you Kenn (Laird) and all for the updates via the forum and every best wish to those affected from Scottish-Deerhound.com.